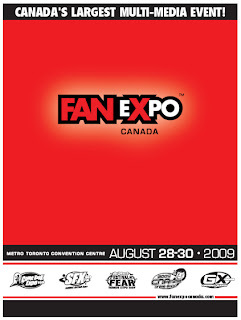 This weekend I will be working at FanExpo at the Metro Toronto Convention Centre in downtown Toronto. It is an enormous sci-fi, fantasy, horror, comic, and video gaming convention. Total geekfest. My partner is a graphic artist so we will be selling shirts and prints in the Festival of Fear section. If you're curious, you can check out his blog here and artwork here. If you're at the convention, stop by and say hello!